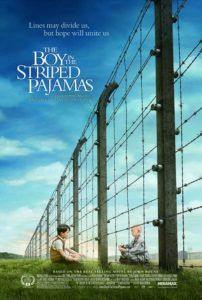 Familiar themes of innocence lost, however overdone in Hollywood’s cookbook, can’t distract from the intense dramatic effect of The Boy in the Striped Pajamas. The purity of childhood exists as the intent, and that might be all the film has to offer. If so, accepting it as a powerful depiction of children’s subjection during the Holocaust, and little more than a story plucking at our heartstrings, will suffice. The almost unfairly sad story centers on an eight-year-old German boy during the early 1940s whose father is a Nazi. Bruno (Asa Butterfield) is an innocent, unaware of what Nazism means and oblivious to the then-current circumstances of his homeland. After receiving a promotion, his father (David Thewlis) takes the family from their extravagant home in Berlin to an icy concrete fortress in the country. Bruno is forced to abandon his friends back home, with whom he enjoyed silly children’s war games, and instead occupy his time with checkers, switching back and forth as both players out of boredom. He asks his loving mother (Vera Farminga) about the farm in the distance out his window. Can he play with the children in there? Why does everyone on the farm wear pajamas? Of course, this is no farm. Mother suddenly realizes the nature of Father’s promotion, and becomes emotionally distant, wanting to leave this place. Ever the dreamer, Bruno reads adventure books, versus the Hitler youth propaganda fed to his sister Gretel (Amber Beattie) by the family tutor. He hopes to explore the world someday, and like any child, embraces his blind curiosity, oblivious to where it leads him. Through the backyard woodland resides “the farm,” where behind barbed wire sits a boy named Shmuel (Jack Scanlon). Bruno no more understands “Jew” than Shmuel comprehends “Nazi”. They’re just two boys. Both the same age. Neither understands why they’re supposed to hate each other. Sneaking sweets to and playing checkers with his new partner whenever he can, Bruno begins to vaguely grasp the situation, but insomuch that he perceives some tension without a warning sign flashing red. Still, Bruno’s curiosity and good-heartedness take him places no child should go. Butterfield and Scanlon handle their roles without the uncomfortable push of some child actors. They’re pure embodiments, outshining even the strong work by Farminga (Breaking and Entering, The Departed) and Thewlis (Naked, Harry Potter and the Prisoner of Azkaban). So rarely do child actors allow the viewer to fully escape, but these boys disappear into the film’s devastating world with aching effectiveness. 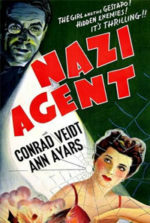 Another filmmaker might have staged the film differently, the focus on suspense or retaining dramatic irony. Imagine a picture where the audience views the world from Bruno’s perspective entirely, where we’re not told his father is a Nazi, where we have to discover that tragic fact for ourselves. 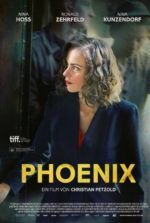 Director Mark Herman adapted his screenplay from the novel by John Boyne, and the presentation lays out the drama without a hint of uncertainty, every implication blatantly clear. This makes the film perhaps overly straightforward, but also works for the end result, as what feels complicated for a child is often deceptively simplistic for an adult. The only mystery is the overall message. Stories like this are sometimes affecting enough in their unmistakable heartbreak, and if tragedy is all the film has to offer, Herman’s effort was a success. But does the film intend to argue anything, and if so, what? That children view the world through innocent eyes and remain incapable of intolerance? That learned in adolescence, hatred is taught, not born? Lessons should be learned from a story this profound. Punctuated with a finale that I won’t describe here, Herman’s film fades away, leaving us without resolution to a number of conflicts that hold our interest throughout. Do Father and Gretel learn the error of their beliefs? How does the family live out the war? Resisting the belief that The Boy in the Striped Pajamas is just another story about wartime atrocities (Then again, how could there be “just” such a thing? ), I allowed the film to soak for some time. After this period of fermentation, I am still unable to identify the film’s profundity beyond the basics of the story, perhaps because the end leaves us empty and horrified. No commentary or message is required, mind you, just preferred. 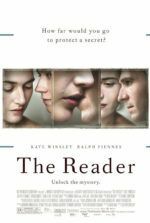 The film’s undeniable ability to shake its audience is enough, I suppose, and what era of human history is riper with drama than the Holocaust? Exposing its fundamental simplicity, the film’s end result is meager from a grand thematic perspective, particularly next to the substance of Au Revoir les Enfants, Schindler’s List, or Life is Beautiful, but still touches important questions about the costs of human life in a stirring, heartwrenching tale.